time, an 8.3 moment magnitude earthquake struck about 10 miles off the coast of central Chile. So far, the USGS has no reports of damage, nor of tsunamis. But that doesn’t mean things are necessarily peachy. “It’s still very preliminary,” says Dale Grant, a geophysicist at the USGS National Earthquake Information Center in Colorado. “I’m sure there’s been a lot of communication disruption in that area.” Although there are no large cities in the immediate vicinity of the quake, the epicenter is about 150 miles from Chile’s capital city, Santiago. Since the initial quake, the USGS has reported four aftershocks, ranging from 5.7 to 6.4 moment magnitude. This story is being updated as details develop. 1 Update: 8:05pm ET 8/16/15 The National Tsunami Warning Center has issued preliminary warnings that tsunami waves threaten many islands in the south pacific—primarily French Polynesia—and just about every country with a Pacific shore. 2 Update: 8:15pm ET 8/16/15 The USGS is now showing five aftershocks, all occurring within 50 minutes of the original quake. A tide gauge off the shore of Coquimbo, a Chilean seaside city less than 100 miles from the epicenter of tonight’s 8.3 moment magnitude earthquake, has logged wave heights in excess of 14 feet. This comes about 90 minutes after the quake struck at 7:54pm local time. NOAA’s Pacific Tsunami Warning Center has predicted wave heights exceeding 36 feet along the Chilean coast, and smaller events elsewhere in the Pacific. Outside of Chile, French Polynesia, a group of over 100 islands in the middle of the south Pacific, is in the most danger. There, NOAA warns of tsunami waves from three to nine feet. 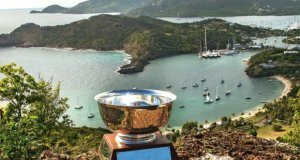 HYSUCAT AT THE LOUIS VUITTON AMERICA’S CUP WORLD SERIES MAY 7-8, 2016.